Should You Take Antidepressants for Postpartum Depression? A new study adds to the depression discussion. Here's what it means for your baby's health. It's not often you read good news about antidepressants and new motherhood, but here it is: the medication may help you stick with breastfeeding. Australian researchers looked at 368 women who were taking antidepressants before becoming pregnant, using data from the Danish National Birth Cohort in Denmark. They compared women who stopped taking their antidepressants after finding out that they were pregnant (or during breastfeeding) to women who continued taking their medication throughout pregnancy and while they were nursing. The result: Women who kept taking antidepressants were more likely to breastfeed for the recommended six months (or more). The research was presented at the 18th Perinatal Society of Australia and New Zealand Annual Conference in Perth. If you've researched antidepressants and pregnancy, you've probably read about the risks associated with taking antidepressants with a baby on board. 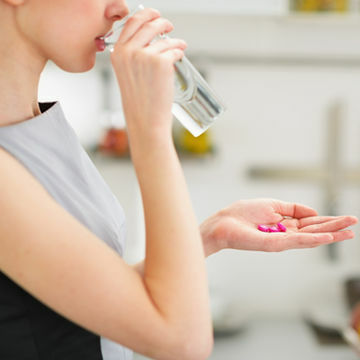 But should you refill your RX after giving birth? If you were already taking antidepressants before pregnancy, discuss your specific medication with your doc, since not all antidepressants are excreted into the breast milk the same: "Paroxetine (Paxil and Pexeva) and sertraline (Zoloft) produce low relative infant doses in the 0.5% to 3% range, while fluoxetine (Sarafem and Prozac), venlafaxine (Effexor), and citalopram (Celexa) produce milk levels closer to, and sometimes even above, the 10% limit," according to a paper in Canadian Family Physician. Even if you didn't struggle with depression before Baby, postpartum depression is serious, and you need to make an appointment with a professional if you're experiencing these symptoms. Help is available, and you don't need to feel guilty about considering medication, if that's what you and your doctor decide.